Never drop your wax applicator again! The Flex Foam Wax Pockets are double-sided applicator pockets made of soft, flexible foam. The Wax Pockets fit snugly around three or four fingers to give you a secure grip as you’re applying car wax. Get even, neat coverage every time with Flex Foam Wax Pockets. A good rule of thumb is to toss any applicator you drop on the ground and start fresh. Using a soiled applicator will contribute to swirls and scratches. However, you can eliminate the problem of dropped applicator pads altogether with the Flex Foam Wax Pockets. The Flex Foam Wax Pockets fit snugly around your fingers. 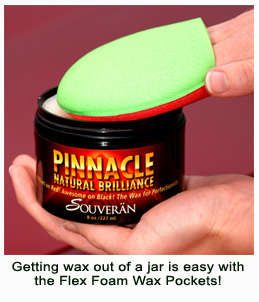 This design makes it easy to scoop wax out of a jar or to apply wax around mirrors or in concave areas. Since each Wax pocket is double-sided, it’s like getting two applicators in one! Apply polishes, prewax cleaners, waxes, sealants, and virtually any other product with these applicators. The foam is absorbent to catch drips and runs but it is thick enough to keep your fingers dry in most cases. Detailer’s Tip: Use a Flex Foam Wax Pocket to apply vinyl dressing to interior surfaces. You can easily apply protectant to the underside of the dash and to the sides of the console without the pocket slipping off your hand. The Flex Foam Wax Pockets are washable and reusable. Wash them with Cobra Quik Clenz Pad Cleaner to release products from within the foam cells. Rinse and lay out to dry. Your applicator is a small part of the detailing process but it can make all the difference! Get your hands in Flex Foam Wax Pockets and you’ll never drop an applicator pad again.